A stealth fighter demonstrator that last flew in 1994 has enjoyed a cultural resurgence in recent years. But the YF-23’s renaissance reflects a pernicious kind of magical thinking that actually undermines America’s national defense. The YF-23 was Northrop Grumman’s entry in the U.S. Air Force’s Advanced Tactical Fighter competition that aimed to pick a new fighter to replace the F-15. Northrop built two of the twin-tail, twin-engine demonstrators. They flew opposite Lockheed Martin’s own YF-22 demonstrators in a series of evaluations in 1990 and 1991. In August 1991, the Air Force selected the YF-22. Lockheed developed the YF-22 into the F-22, which finally entered front-line service in 2005. 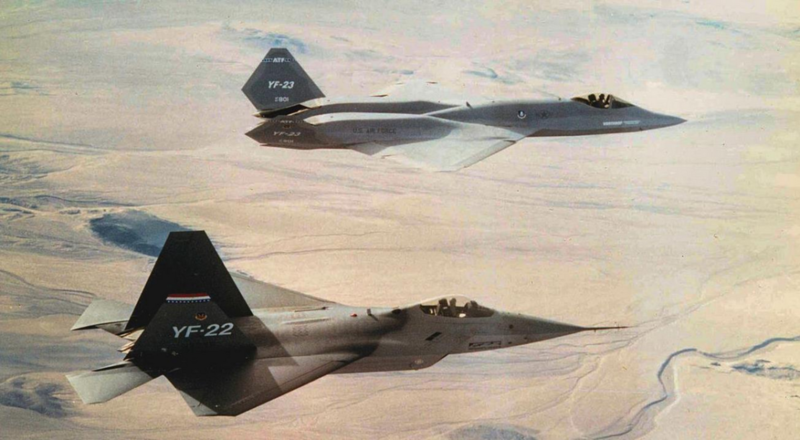 Northrop donated the YF-23s to NASA, which ultimately passed them to museums. The planes flew to the space agency’s Dryden Flight Research Center in California some time in 1994. It was the last time they flew. More than two decades later, the YF-23s are popular subjects of a certain brand of “what-if” journalism. “Many analysts … have argued that Northrop’s YF-23 was truly the better plane,” Kyle Mizokami wrote for Popular Mechanics. “What would an operational F-23 have looked like?” Dave Majumdar asked at The National Interest. Majumdar, Mizokami and Rogoway are professionals. They are my colleagues and, in some cases, my friends. I don’t mean to attack them. In writing about the YF-23, they’re responding to demand as much as they’re creating it. The mythologizing of the YF-23 isn’t their fault. Rather, it’s the symptom of a dangerous belief that’s widespread and deeply-rooted in American culture, and in military circles in particular. That technology will save us. And if technology isn’t saving us, it’s because we developed the wrong tech. “Technology shapes thought even as it becomes a substitute for it,” wrote William Astore, a teacher and retired Air Force colonel. The F-22 is an effective, if outrageously expensive, warplane. The type has flown hundreds if not thousands of combat missions targeting Islamic State militants in Syria. Critics rightly have questioned whether former defense secretary Robert Gates erred when, in 2009, he ended production of the F-22 at just 187 copies — far fewer than the Air Force said it needed. But the F-22 won’t end terrorism. It won’t stop Russia from exerting its influence along its periphery in order to work out the national trauma of past wars. It won’t stop China’s explosive economic growth and commiserate military expansion. It won’t reverse America’s disastrous invasion of Iraq or bring a tidy end to the nearly 20-year-old U.S. war in Afghanistan. For all its high-technology, for all the time, energy and money the United States has poured into its development, the F-22 isn’t saving us. So it perhaps is natural that we’d ask whether the F-22 was the right choice. Maybe, just maybe, the F-23 could’ve succeeded where the F-22 failed. What if the Air Force had picked the other stealth fighter design? What if America were stronger? What if we were safer? What if the whole world were a better place? “Americans tend to see technology as a panacea,” Astore wrote. “Even deadly technology.” When natural and historic forces prove, as they so often have done, that tech isn’t a panacea — that the planet will warm, that societies will build walls to keep out the others, that fear more than any other impulse will drive human decision-making — Americans blame the tech, and look around for a replacement. Even if that means looking into the past at a long-grounded prototype airplane and imagining an alternative present where that airplane kept flying … and presumably changed the whole world for the better. The YF-23 won’t save us.